"I'm turning thirty this year. And you know the saying, a woman over thirty is more likely to get hit by a bomb than find a man." ---Fanny Fink, an indie pop Korean band What oh my is she "30" already? That woman is going to become berserk and will have a hard time finding a nice, young, man.Well that's what happens, if you turn 30 without the very warmth and security of a nice guy! Katherine Carlson, a Canadian author, has crafted the story of a woman who has just turned the big 3-0H, i.e. "30" in her new book, Story Girl. Tracy Johnston is the protagonist who is not on the verge of having a meltdown, instead she is already having one with all her big move to the tinsel town, LAX.Thanks to the author, Katherine Carlson, for sending me over the copy of her book, in return for an honest review. Tracy Johnston has turned 30 and unfortunately she is so not like her traditional mom and her way too perfect sissy and has moved to Hollywood. Her Hollywood boyfriend turns out to be very gay and wanted to marry her to hide his sexual orientation from her parents. Eventually, Tracy gets fired from her only job and bit-by-bit tears away from her dream job. Her big move turned out to be a complete flop. But then her car crashes! With whom?!! Oh my, he's a total looker and his name is James, but he carries a lot of baggage on her shoulder. But it's getting difficult for Tracy to stop herself from falling for James? With her determination to reach her goal, will Tracy allow James's distraction in her life at the moment? Story Girl is an absolutely hilarious and witty book with a "full of life" protagonist, Tracy! No doubt, she is the epitome of all those "30" plus women, but also she's an inspiration for all other girls who her trying every ends to achieve their goals. Tracy is a character who has got a lot of depth and wisdom and outrageously funny at times. Her chemistry with James is totally bed-burning and rocking. And James is a completely nice guy who any woman would want to make him the sweetheart of their life! Tracy's issues are somewhat very realistic; every woman to this day also faces with issues like Tracy and the solutions and the ways Tracy handles her problems is something very interesting and remarkable. And reading this book, really made up my gloomy mood and I felt the book has got quite an engaging plot. With the author's narration, the story becomes more delectable and riveting. This is a quick, light and funny read! So ladies, don't forget to pack this book in your handbag on a long train journey! I loved this book - I just really found the protagonist funny! She is such a basket case, and yet, it is only the pressures of other people that make her so. Left to her own devices, she is smart, witty, and incredibly ambitious. But alas, we don't exist on our own. Life is about merging and compromise. And through our push and pull with others, we learn, we grow. This is certainly a book that I would like to see adapted to the silver screen. Hands down. I found myself laughing out loud at the antics of Tracy Johnston. The book deals with very modern themes - sexuality, narcissism, ambition, the ties of family, and the value of integrity.The book is funny, quirky, and quick-witted. Everything is filtered through the eyes of the female protagonist who desires to be a successful screenwriter. But thus far, all of her attempts have been politely rejected or downright squashed. She meets James, a guy who seems equally ambitious but really isn't. And a faltering romance takes shape... A lot of the book takes place in the mid-west where Tracy ends up trapped with her family - a fate she initially dreads but one that will ultimately, and ironically, set her on the path to true, authentic success. A story of one woman and how on her journey to find herself, she in turn helps so many others.3 Stars!Series: NoneCharacters: Tracy JohnstonSetting: HollywoodStory Girl follows the few weeks after Tracy Johnston turns thirty and, according to her mother, her life ends. Thirty, jobless, and without a man, Tracy feels lost in her life, pulled in one direct by her heart and in the other by her mother. When a men enters her life that has the power to clear the fog from her inspiration and change her life forever, she lashes out. Story Girl is a quirky tale of a woman who finds her spirit, helps heal hearts, and learns to be comfortable in her own skin.Story Girl's plot is paced in a way that makes the reader feel as if they are physically there with Tracy through all of her heartaches. I experienced her family struggles and cried with her and wanted to yell when she yelled. She's a smart mouth and unafraid to speak her mind, however, her mind often boarders on cruel. She treats those around her with an acidic tone that stems from her unhappiness with herself and it gives the whole book a more immature feel than what I think the author was aiming for.Recommendation: This is a light and amusing read that took me on an emotional ride with the characters. Fans of real world drama stories can enjoy this novel and Tracy's journey as she finds herself within the pages of her own stories. Tracy Johnston is starting a melt down. She has turned thirty, found the best available guy in Hollywood was gay and wanting a marriage so he can hide from his parents, has no one interested in her scripts, rear ended a car, and lost her day job. All can't be that bad in the world.. afterall, it is a hotty that she is kinda into that she crashed into. James Wilson has stepped out of Tracy's dreams, but he carries some major baggage along the way - a writer, a spoiled rich boy, a runner (think Peter Pan Syndrome with a whine). Tracy runs herself from reality, to home which might be too much for her to handle. Her parents are celebrating 35 years, they live on separate floors in the house now, her grandmother has a dark secret she must release, and her sister just doesn't get her.This is an okay book. I think the characters were somewhat unlikable - Tracy at 30 melting down every other hour it seemed, she is a bit off, and yet has a cruel streak that shows a very ugly center, James feeling weak, whiny, childlike for being 31..the story is a bit pretentious and self edifying - yet, there is humor that can be very hard to put down on paper, a wise mouth, smart alec, way of thinking (think Juno) that shows Ms. Carlson has some unexplored talent for and I hope to see in another book. A book about a girl who is trying to make her way through, That's probably the best way I can describe it. Tracy is trying to make her way through from one stage in life to the next. Is writing what she really wants to do? Not sure, I did not get that sense of passion from her. A girl with confidence....no. She is a girl who right now is testing others...her family, her boyfriend......she pushes really hard but seems to need acceptance from these people.I like the character of the dad. He seemed down to earth and the only member of the family that really had a passion towards anything. I liked the description of his garden and the shed. The description of the shed was the best. On the other side of the coin I felt that James wasn't a real character. In fact he seemed a bit creepy at times. Also some strange conversations for a couple that hadn't known each other except for a few days. I enjoy reading it though and felt there's talent here that promises better work in the future. I won this book off of goodreads.I knew nothing about this book going in. I just knew that I won a free book. YAY!Tracy is a 30 year old that is about to jump off the edge. She is in a rut, and she has no idea what to do with her life. This is a very simple story. However, it is a very realistic story. I love Tracy and her chaotic mind. She is restless, odd, and her family does not get her.It turns out that her family is more lost and on the brink of destruction than she is. What does a girl do in a world that demands you to have all your ducks in a row at a certain age? Remember what it was like to turn 30 without clear direction of where your life was going? That is what Tracy Johnston's confronts in Story Girl. 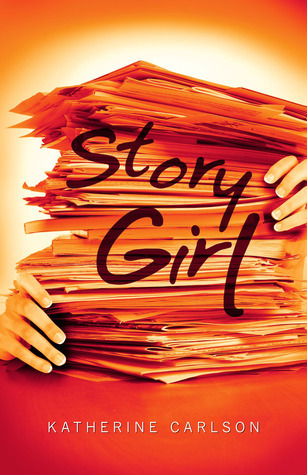 Story Girl is delightfully written with everything the reader could ask for: intrigue, humor, and laugh-out-loud moments, as Katherine weaves us through the ups and downs of her character trying to be somebody. Long live SpaceBoy. I'd very much love to see this novel transformed into a movie, and hopefully Story Girl2 in the future. Through goodreads I received an ARC copy of this book from Kathrine Carlson in exchange for an honest review, thank you!This book is about how life, love and family can be messy. Which I think everyone will relate to. The main character is crazy and funny! I found myself at times wanting to yell at the main character and other times laughing. It was a very fun summer read! This book is fantastic! Absolutely loved it! It had me hooked from the first chapter! It was hard to have to put it down! I found the main character to be very likeable and had me laughing out loud on the train to work (which got me some funny looks) but was well worth it! I am really looking forward to a Story Girl 2!! This is a wonderful book that I highly recommend. It contains a variety of true to life story lines within the main story line: love, job issues, family drama ... You will enjoy reading this book. This was a freebie ebook. I enjoyed reading it on the beach in Mexico. Nothing too intellectual but interesting. It was a a good beach read but compelling enough that it repeatedly pulled my eyes away from the view of the gorgeous Caribbean waves ... that's a big compliment!